Welcome back to our most favorite website in the whole wide world, Store of the Week. Okay, okay, maybe it's just my favorite, and not yours. Anyway, our store for this week is about this dude with the forty thieves. Yup, I'm talking about the guy who found this magic carpet, met a genie, fell in love with the king's daughter Jasmine, fought this bad wizard named Jafar, appeared in this Disney flick, had a duet with Lea Salonga, and lived happily ever after. 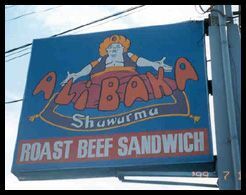 Yes, I'm talking about Sinbad...ahem...I meant Alibaba. What you probably didn't know was that he was also a very business-minded person (so what else is new?) He had a lot of extra money (heck, he had a whole kingdom of money! ), so he decided to open a chain of take-out restaurants.